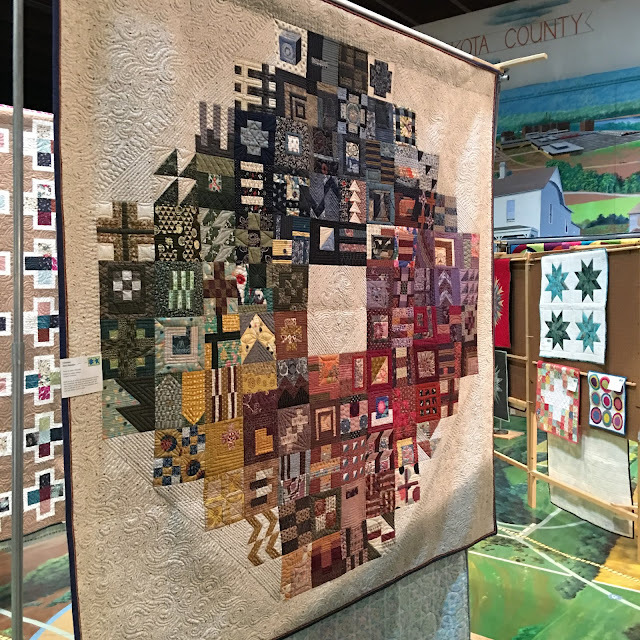 Very excited here--just found out my "Tsukubai" won 1st Place Viewer's Choice at the Dakota County Star Quilters quilt show! And my 2016 Row By Row quilt won Honorable Mention! Now, let's get on to some quilts hot off the rollers. 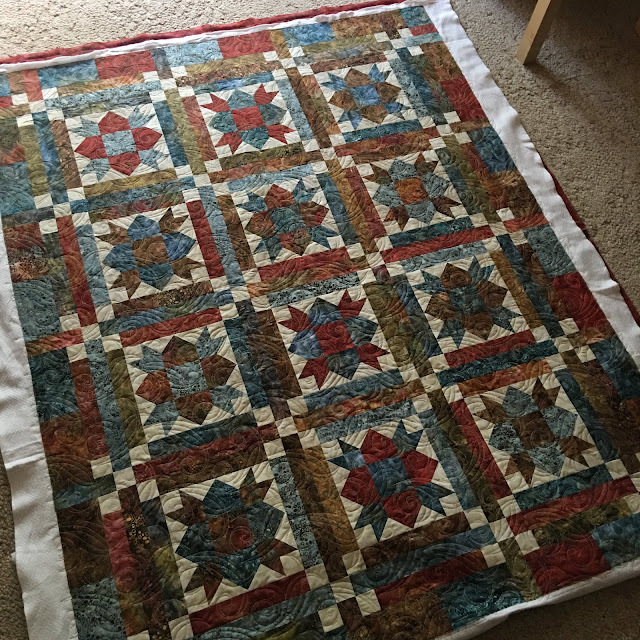 Here are a few quilts my clients have been making recently. Karen asked me to quilt this giant piece of designer fabric. It is made by Marimekko of Finland. She requested tennis ball size meandering. 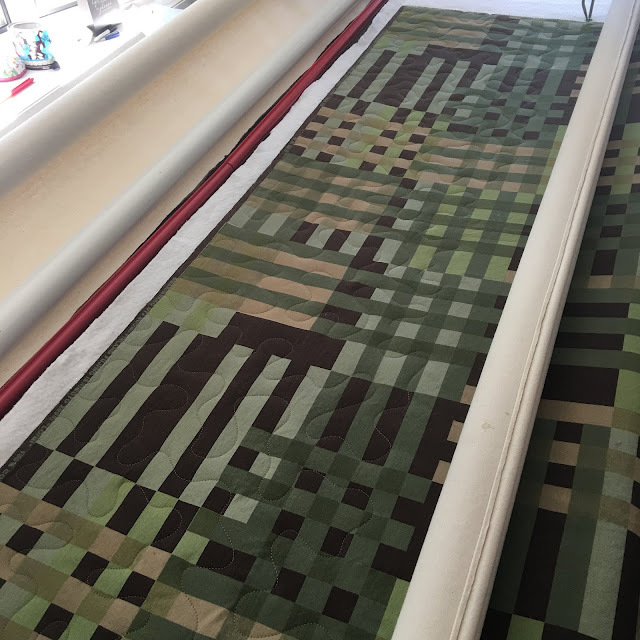 There is nothing more fun than meandering on a longarm! As you can see on the top roller, the backing is Minkee, which makes it super cuddly. 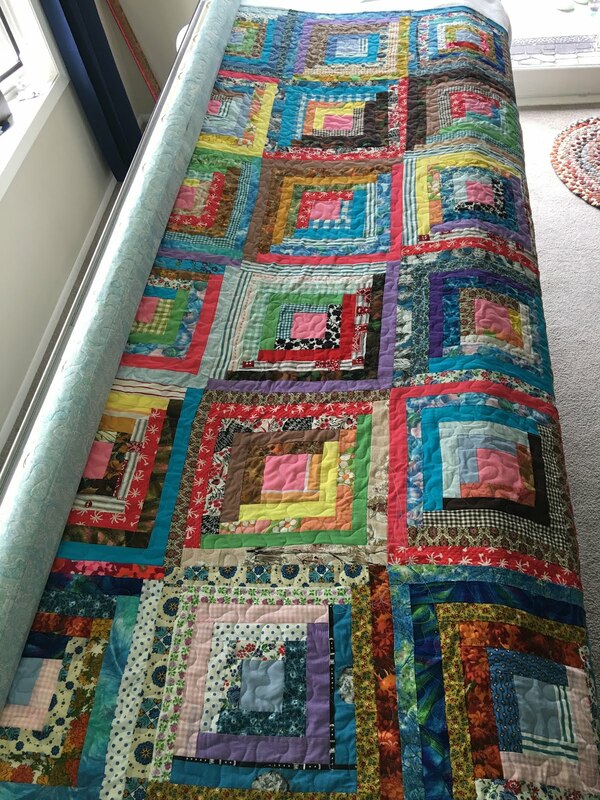 I can relate to long quilts! This one finishes at 59" X 107". Kim found this log cabin quilt top in a box. It was pieced by her grandmother, who has been gone for 26 years now. The fabrics look like they're from the 40's, 50's and 60's, all leftover scraps. 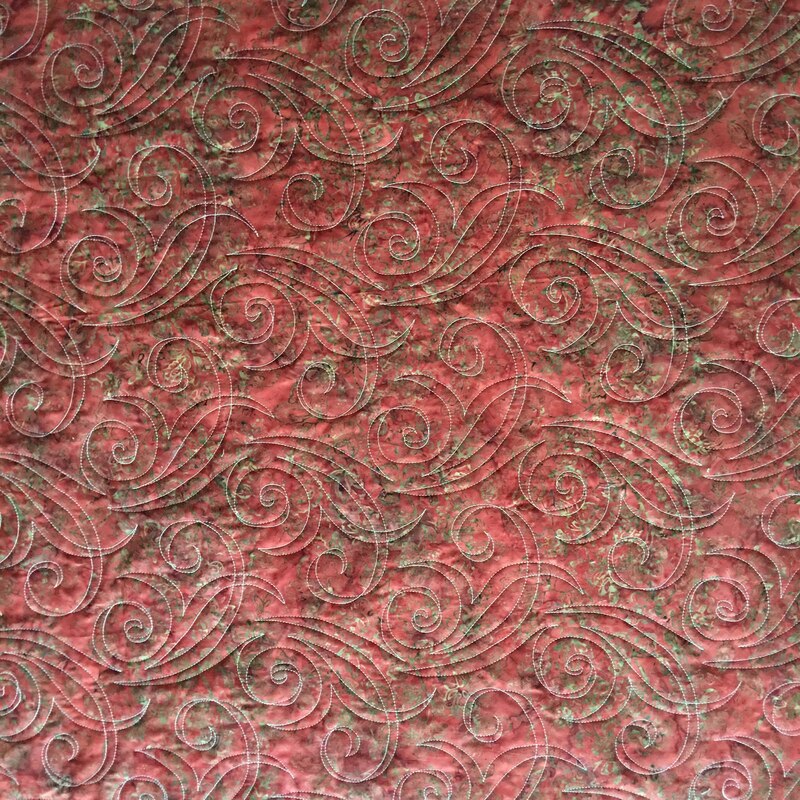 Here's what the back side looked like, before quilting. She foundation pieced all the blocks on muslin, gauze and flannel. Kim will be giving the finished top to her mother for Mother's Day. I'm sure the fabrics contain a lot of wonderful family memories. 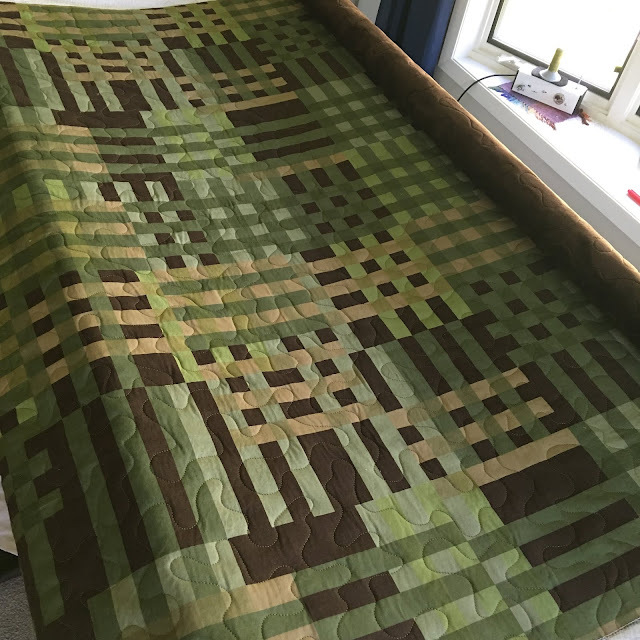 This is Wendy's mystery quilt from Glad Creations, 2017. The quilting is a very swirly design called "Lovegrass". Wendy used batiks, including the backing, where the quilting really shows up! And here is the big picture! 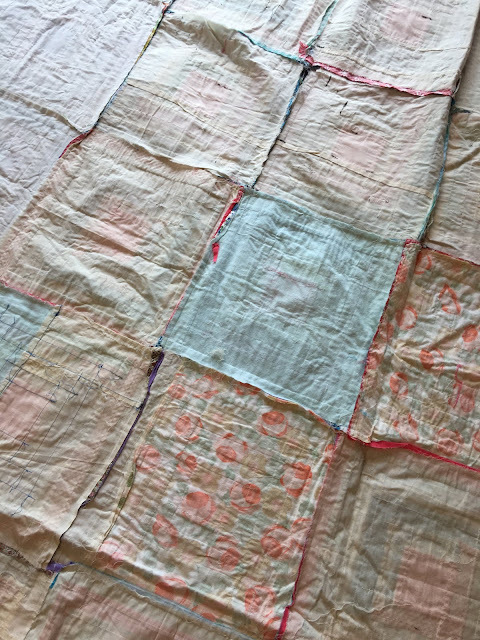 Check out all the interesting quilting links at Crazy Mom Quilts, Confessions of a Fabric Addict, Busy Hands Quilts, Kokaquilts, She Can Quilt. Congratulations on the awards! Your quilts are gorgeous. You've been busy at your long arm. That log cabin is just lovely, and I'm sure will have many memories. What a treasure! Congratulations on your two ribbons!! Congratulations on your two wins at the show. 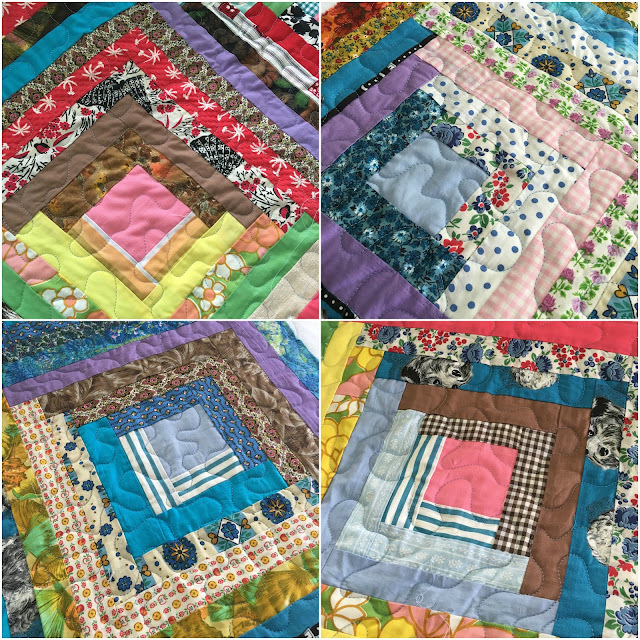 They are gorgeous quilts! You have been very prolific with your quilting this week! Love that vintage log cabin quilt. 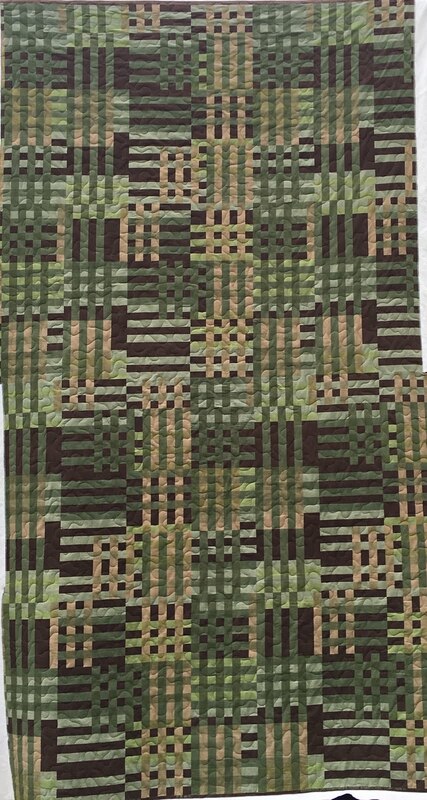 Congrats on the Show Quilts. Congratulations on your first and second prizes! Beautiful quilts! 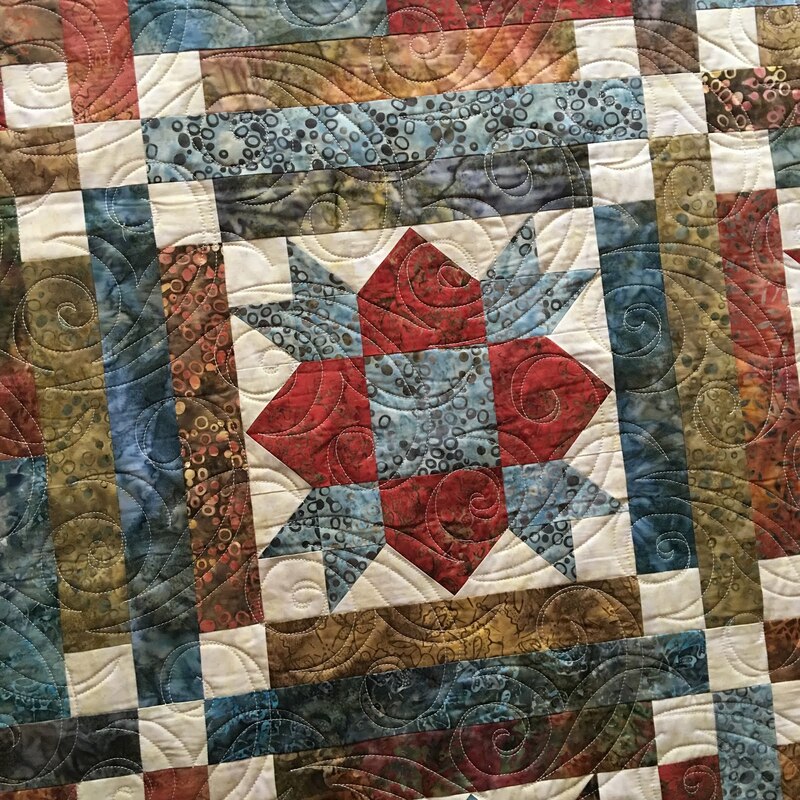 Kim's log cabin quilt will be a very special Mother's Day gift! Thank you for sharing! Awesome quilts, congratulations on your well deserved ribbons! These are some great customer quilts. I think finding grandmother's quilt is such a precious find! CONGRATULATIONS on your wins - that is fantastic!! Congratulations on your wins! Nice to take home two ribbons from one show. Both are terrific quilts. Love seeing your customers quilts and your long area work. Congratulations on Tsukubai winning! I love that quilt, it's probably my favorite quilt of yours (so far). Thanks for sharing customer quilts, I always like to see what people are sending in just in case I ever want to consider going into business! Wow! Nancy, this has to be one of my favorite posts that I've read today. a little bit of everything from vintage to new. 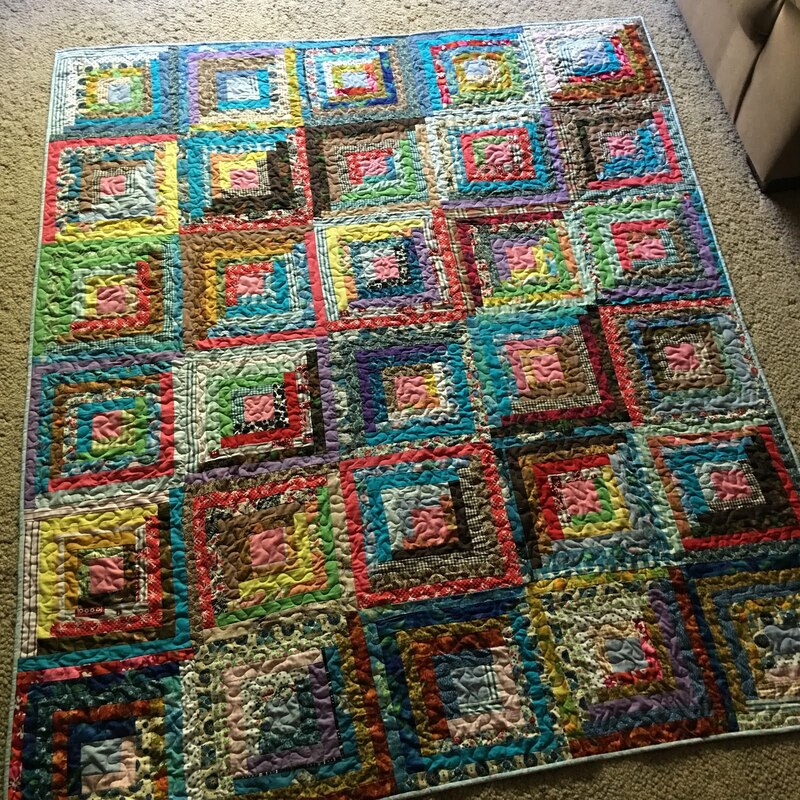 I love seeing old unfinished quilt blocks made into something to be cherished. Beautiful quilts and quilting! Congrats on your ribbons! Congrats on two very well deserved awards. It's such a treat to see the grandmothers quilt, what a wonderful find, Kim's Mother will be overwhelmed. Thank you for sharing. Wow Congratulations on the win and well deserved! 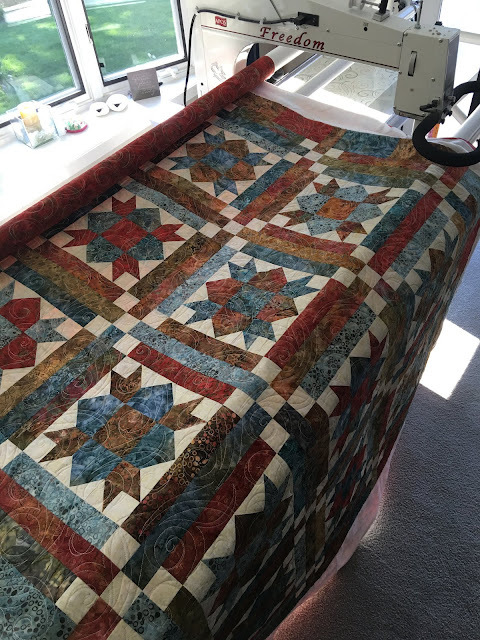 Great piecing and quilting on it. Have to say I love that scrappy log cabing too - and great that it is finally a quilt that can be used. Thanks for linking up to #scraptastictuesday! 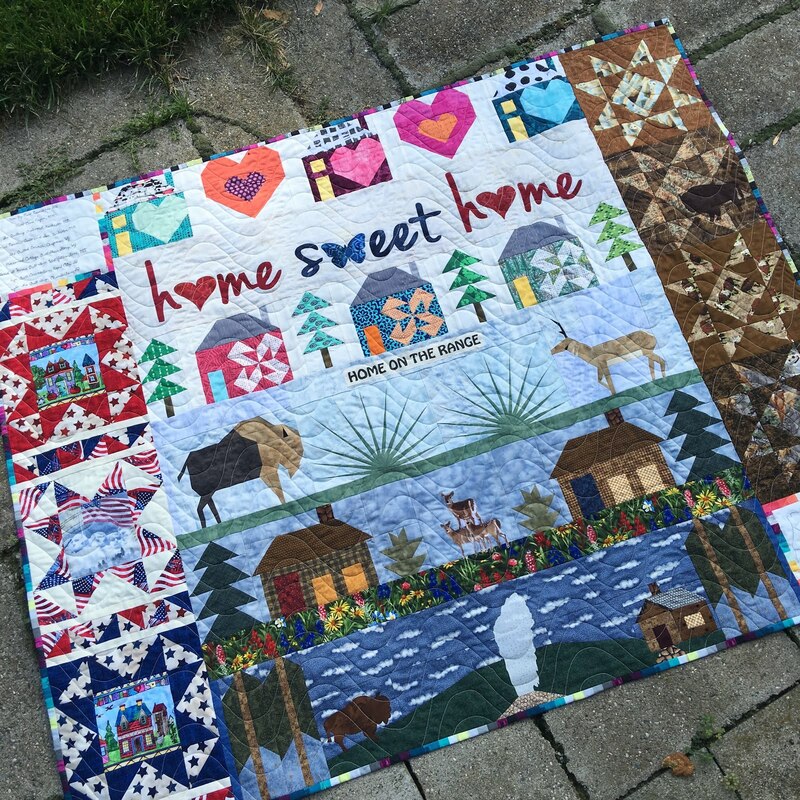 I love your Row by Row quilt! Thank you so much for finishing Grandma Rose's quilt. My mom had no idea that I had taken it while we packed up their lake home when they moved back home....she was blown away when I gave it to her for Mother's Day. She keeps remembering all of the different aprons, dresses, blouses, curtains and ticking that the fabric came from. I also found out that Grandma most likely made it on the old treadle sewing machine that my mom has. As an added bonus, Mother's Day would have been Grandma Rose's 122 birthday.....she passed away in 1991 at the age of 96. So glad it made her Mother's Day, Kim!!! Fabrics can trigger a lot of good emotions. And how special that it was your Grandma Rose's birthday on Sunday. Smile! Such beautiful quilts, Nancy. Congratulations on your beautiful winner! I didn't know stippling could be golf-ball sized. lol I think I'd forget and make the stipples smaller and smaller as I'd work my way to the end so that the top would be soft and squishy but the bottom not so much. That might make for a little warping as well.